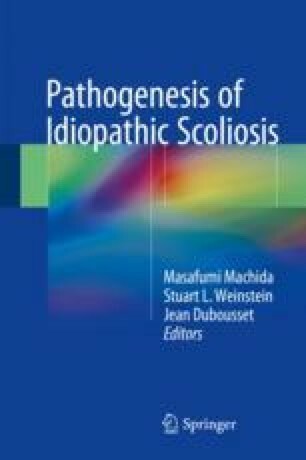 Adolescent idiopathic scoliosis (AIS) is the result of complex multifactorial phenomena, including biomechanical issues. The spine, as a central part of a musculoskeletal construct from the head to the pelvis, has both to withstand loads to maintain a stable erect posture and to allow multidirectional mobility and stability with controlled intervertebral motion. Growing spine in adolescent idiopathic scoliosis (AIS) is characterized by three-dimensional global and local changes. A biomechanical cascade, the mechanism of which is not yet fully understood, impacts both tissue geometry and their biomechanical characteristics. This chapter on clinical biomechanics of AIS provides recent advances on 3D geometric and mechanical modeling of the spine and their clinical implications. 3D reconstruction from low-dose biplanar X-rays is a recent technique that is now routinely used in many hospitals. It provides visualization of the scoliotic spine and trunk, particularly from the top, and a large set of quantitative clinical 3D parameters that come in complement to the Cobb angle. The use of mathematical data analysis techniques allowed early detection of progressive spines. Quantitative shape assessment also allowed objective analysis of brace or surgical treatment effects on each individual patient. Such novel 3D quantitative analysis should drastically enhance our understanding of the mechanisms underlying AIS development and correction. Moving from geometric to biomechanical models requires deep understanding and realistic modeling of mechanical characteristics of soft tissues, particularly the intervertebral discs. In vitro analysis gives an insight in the changes that occur in the structure of the scoliotic disc, and recent techniques based on MRI or ultrasound elastography appear promising for in vivo assessment. Based on 3D reconstruction from biplanar X-rays, subject-specific biomechanical models are now proposed for the investigation of AIS spine and trunk, with a tremendous potential both for a better understanding of the basic biomechanical behavior and for computer-assisted planning of a personalized treatment. However it has to be kept in mind that models do simplify a highly complex structure, and therefore a thorough validation process has to be conducted before considering such models as predictive for a clinical use. Particularly, evaluation has to be performed on the whole set of clinical parameters of clinical interest. First validation frameworks progressively appear, and first in vivo validated models, although still mainly in research, open wide perspectives and should become mature in a near future, bringing an invaluable tool to the clinician for diagnosis and assessment of optimal treatment strategy. Such advances in clinical biomechanics of the AIS rely on efficient dialogue between clinicians and engineers, which is the key for future translation toward AIS management based on biomechanical principles. The authors gratefully thank all the spine team of the Institut de Biomécanique Humaine Georges Charpak and the clinical partners who participated to research on scoliosis. Recent research was supported by the ParisTech Foundation within the BiomecAM chair program on subject-specific musculoskeletal modeling, with the participation of Cotrel Foundation, Proteor Company, Société Générale, and Covea. Pietton R, Bouloussa H, Vergari C, Skalli W, Vialle R. Rib cage measurement reproducibility using biplanar stereoradiographic 3D reconstructions in adolescent idiopathic scoliosis. J Pediatr Orthop. 2017. https://doi.org/10.1097/BPO.0000000000001095. Epub available.